Soap and water on a slightly damp sponge or soft cloth works great on cleaning piano keys. You can use a mild dish-washing liquid for the soap, diluted with water. Just don’t use so much liquid that you will get moisture into the keyboard. Wipe the sponge or cloth towards you and not side to side. Clean one octave at a time and dry before moving on to the next octave. Avoid colored cloths that may bleed and transfer color onto the white keys. Real ivory isn’t used on pianos anymore but if you are lucky enough to have a piano with ivory keys you can follow the advice above and just make sure to wipe off the excessive moisture after you clean the keys. Ivory can warp if it remains wet for too long. How can you tell if the keys are ivory or plastic? 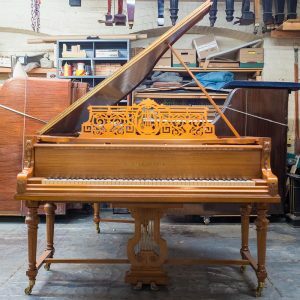 Real ivory keytops are in two pieces. If the keytop is one piece, it is plastic. During cold and flu season you might want to disinfect your piano keys. Don’t use Lysol or similar disinfectants on your piano keys. Instead, clean them with a solution of 3 parts filtered water to 1 part white vinegar using the general cleaning tips above. If your piano keys are severely stained or yellowed, contact a professional.